GF Ontario Blog: 14,000 Fans Giveaway!! 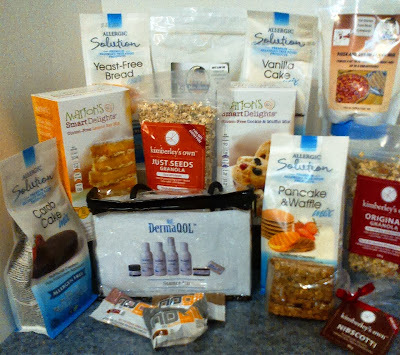 The total prize is valued at $250 and includes some Allergic Solution products, cookbooks, a gift certificate and other products that are available on Gluten Free Smart Store - wow! The above picture shows just part of your prize! This is huge, guys. Please enter below. Good luck! So excited you made it to your milestone! You are great source of information! I am not 100% gluten-free but have started to reduce my intake. Trying to find replacement products I am happy with. I have no other diet restrictions. Congrats on your milestone! I am 49 and was diagnosed with celiac disease at the age of 18months. They could not figure out what was wrong with me at the hospital in Brampton and I became so mal-nourished and sick that they had to have someone from Sick Kids come to see me instead of sending me there. They tried lactose free among other things and finally tried gluten free. When I gained an ounce it was a big celebration on the ward. Gluten free saved my life! I have been gluten free for over a year, no other restrictions but find that I notice dairy sometimes bothers me more now.